easyGO is a special wheeled chair featuring a unique patient lifting system. easyGO is a special wheelchair with a unique patient lifting system. As simple as pressing a button, it allows caregivers to lift their patients with minimum effort. Equipped with an electric motor and powered by a rechargeable battery, it allows you to lift the patient with only two movements and place him/her on the bed, the wheelchair, the toilet, the car or else. The ideal low volume wheelchair that comes to provide solutions to the patient and his/her environment in everyday needs such as lifting, daily hygiene, home transportation, access to the car. The electric lift system makes the process fast, efficient, convenient and ensures the dignity of the patient lifted. Get the innovative, stylish aid and give yourself and your family the opportunity to improve your living conditions. With easyGo, all difficulties that caregivers face to lift a patient off his/her bed are minimized. Lifting is done easily and safely, without requiring the caregiver to exert excessive physical effort on his waist. 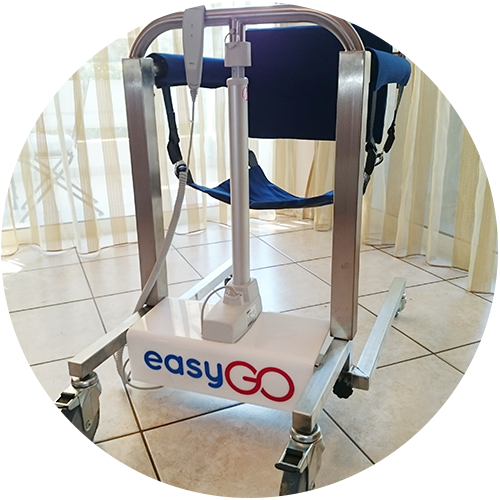 EasyGo can be used to move the patient inside his/her house, either for his/her personal hygiene or to go out on the porch, or just to spend some time in a seated position, which is suitable for people who are forced to stay in bed. Boarding on the car for a person with mobility difficulties is usually a very difficult process. Now, thanks to easyGo, the caregiver or any person in the patient’s environment can help him/her, without any particular effort get in or out of the car.